The store is a Walker, Michigan based retailer. They have stores in Ohio, Wisconsin, Kentucky, Indiana, and Illinois too. With 72,000 employees, it’s one of the largest retailers in the U.S. A family company, which retails a wide range of pet supplies to the grocery. The structure of their supercenters also cover services like a car wash, fuel, manufacturing and more. One thing is beautiful about their stores. They are open for 7/24 364 days. Since that’s the case, I can easily call Meijer one of the most competitive stores in the U.S. We generally focus on their weekly food sales but they got many more. Meijer Ad is among the weekly ads of USA retailers and they have local products, food products, $1 deals, mix&match sale, recipes, best drinks, seasonal products, supplies for varying areas, and the best prices of the retailer on those weekly ads. While being a great food or weekly food products supplies it also retails clothing, footwear, summer products occasionally depending upon the time of whatever is needed by the majority of the consumers of the corresponding location. Meijer has its name in providing lovely prices for the excellent quality of weekly needs and taking this feature of this brand into consideration we review and share the good products with you after we notice while browsing their weekly ads on our own. Join this discussion about Meijer Weekly Ad deals and newly published products and save more learning and getting a conscious consumer. While processing in this area you will discover fresh grocery, organic food, healthy snacks of Meijer Ads and you will profit from the weekly online shopping. And more retailers are available. Learn How To Do Coupon Matchups and save more with this stores weekly ad. Ground beef patties 80% leadn ground $4.49 lb. See more produts on the preview page. All the offers by latest Meijer Ad are available. As all other retailers do Meijer Weekly ad offers the top meat products and the fair prices for such option of shopping that is available to all of online customers. It is easy and safe way to shop if you visit the official page of the Meijer. Moreover you will find the widest product range you can. You might want to visit this Meijer ad. If so, click on the image of the page where the meat product range is started to be exhibited. Certified angus beef boneless chuckeye steak $4.49 lb. Meijer 80% lean ground beef patties $4.49 lb. Meijer 90% lean ground beef $4.99 lb. Fresh wild caught $9.99 lb. Cheez it sunshine crackers $2.49 SALE ! More of snacks, beverage and packaged food products can be seen on pg 11. This sale of Meijer Ad will make you save more and more. 90% lean ground beef $4.99 lb. Fresh grade a boneless chicken breast $2.29 lb. 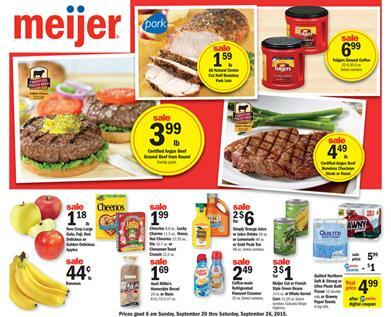 Meijer Weekly Ad Preview Sep 27 - Oct 3 2015 offers are heavily regular products of food. For saving more and getting top quality fresh fruits, veg, beverage, snacks, meat products, BUY 6 & SAVE $6 products, mix&match deals, bakery products and others. 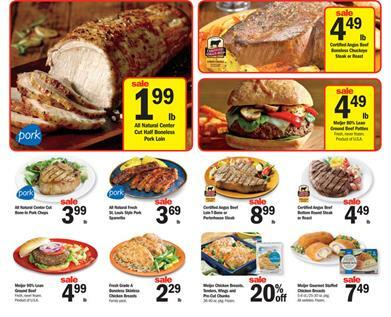 Meijer weekly ad meat sale is available on pg 2. Online products of this meat sale is one of the best. Packaged meat products of Meijer are available on pg 3. This includes a finest selection of sausages, patties, meatballs. Seafood is another thing you can find on the same page. Check out PG 3 for the catfish fillets, Meijer shell-on shrimp, Jumbo snow crab and other excellent choices. 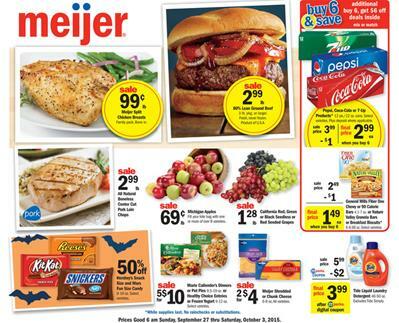 Latest Meijer Weekly Ad Products Sep 20 - Sep 26 2015 can be viewed on the preview page here. Read the review for the most popular products, lowest prices possible at any of grocery stores and best meat sale. Check out all the details on the browser with simple use featuring quick seeking. Meat sale is available on pg 1. Boneless chuckeye steak or roast, ground beef and more. Also see fresh fruits, new price of coffee mate, Meijer cut or French style green beans and more products on the main page. 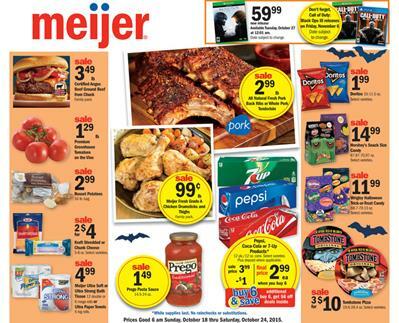 Today you can shop for the latest products of Meijer weekly ad for the lowest prices. CANNED FOOD products focused on soup and noodles. 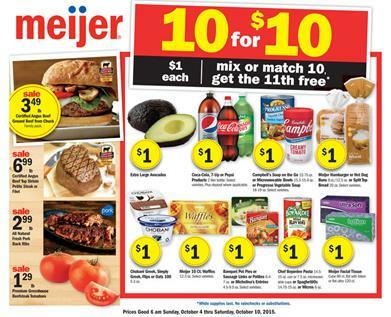 Find out new low prices of the delicious products of Meijer Ad on PG 11.